The most direct way is via email. I'm not a big fan of Facebook because of their refusal to allow users absolute control over their own personal data, so you won't find a personal page there. The best way to interact with me is via Twitter. 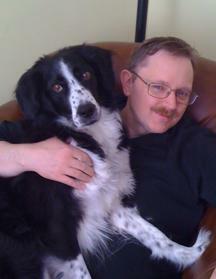 The author with his daily walking partner, Jib, a Springer Spaniel-Border Collie mix.